When doing some hard shopping in Orchard Road, one must know how not to over exert oneself. How so, you may ask. Well, the answer is very simple. Be aware of all the secret resting and refreshment spots around town! One such secret resting spot is a tiny cafe tucked at the end of a bookshop. The bookshop happens to be tucked on the top retail floor of one of Singapore’s most beloved malls. Okay to cut to the chase, I am talking about Jams. Not the jam in a jam jar jam, but Jams the cafe, situated at the back end of Prologue at Ion Orchard. It is far away from the maddening crowd, and being situated within a bookstore, and book stores are normally not that noisy, it is a very good spot for resting and chilling out (before the next mad dash through the shops again). Last Saturday, the place was occupied by many students, presumably cramming for their mid-year examinations. Still I managed to find a seat without waiting. I didn’t feel like cake, even though there were a great many to choose from. They even had an apple cake, that looked very much like carrot cake from far, which is something we don’t find that often in Singapore. The apple cake I mean, not the carrot cake. In the end, I ordered a blueberry scone to accompany my hot chocolate. It looked really ugly but I ordered it against better judgement because I really wanted a scone. The scone was about $2.50 but I was shocked to discover I had to pay extra for jam. 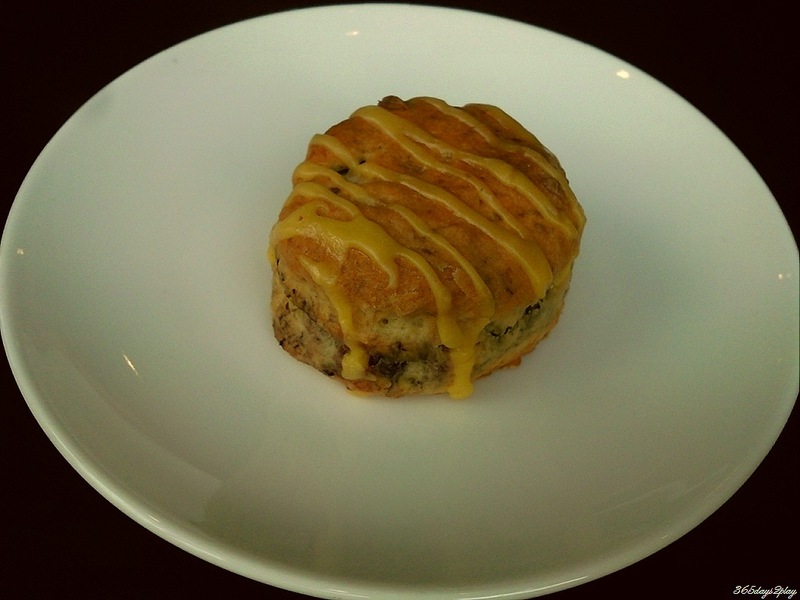 So behold, the naked scone above. I paid $0.30 for the jam in the end and it turned out to be the individually packaged supermarket type. The paltry amount wasn’t even enough to cover half the scone! What a let down! 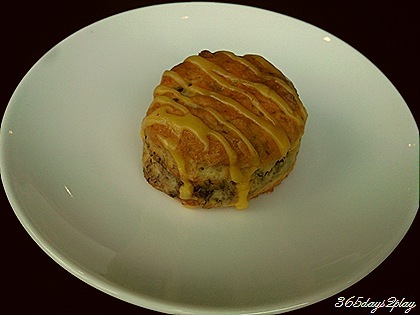 The scone was okay, but it would have been better if there was more blueberry flavour to it. Btw, I think Dome Cafe makes really good and cheap scones, and they give you jam preserves as well as whipped cream for about $2.50. 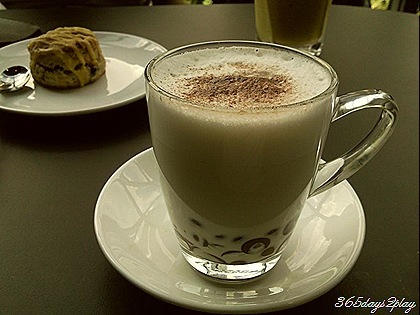 They also had the usual cappucinos and lattes, as well as a selection of teas. I wanted something chocolatey and there happened to be iced chocolate in the menu. I thought I’d ask for it hot. What I did not realise is that they also had hot chocolate, but it wasn’t the “normal” type. It was hot chocolate couverture! See picture above? You will be able to see the chocolate couverture bits, with white milk on top. Only after you stir it does it blend into a really thick chocolate concoction. 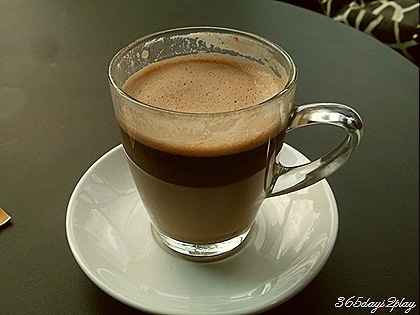 Each sip was like drinking pure chocolate liquid. It was SO GOOD I forgot all my troubles for a while. Until I hit the halfway mark and I suddenly felt too full to continue. No regrets even though I’d originally ordered the normal hot chocolate. I would suggest that 2 people share this drink, in order not to get an overload of sin. But hey, they say chocolate is good for the heart, so, indulge! 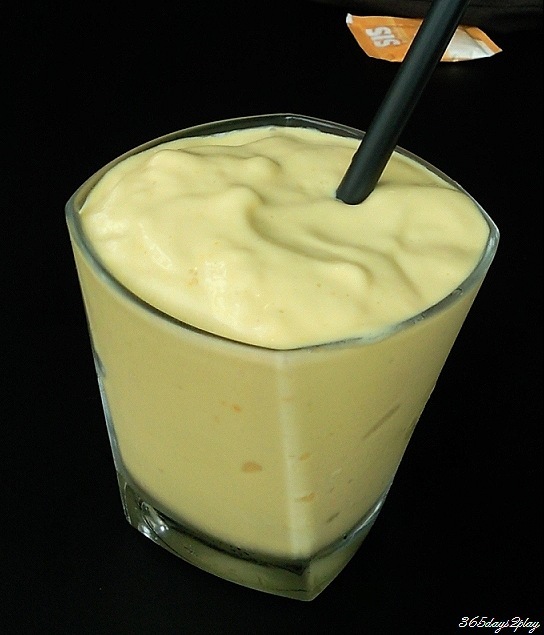 The partner ordered a mango smoothie out of the numerous fruit smoothies on offer. As you can see, it is thick as can be, which means that a truckload of ice-cream must have gone into it. 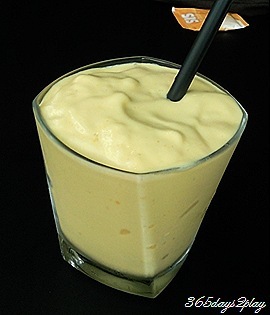 Definitely something that would delight smoothie lovers. I’m not a smoothie lover myself. I prefer to bite and lick my ice-cream, not drink it. But even I had to agree that it was quite good, the sip that I took. 2 people, 2 unfinished drinks, 2 very satisfied people.